St Kilda is an inner suburb (neighbourhood) of the metropolitan area of Melbourne, Victoria, Australia, 6 km south-east of Melbourne's Central Business District. Your cultural itinerary includes sights like Scienceworks and St John's Anglican Church. 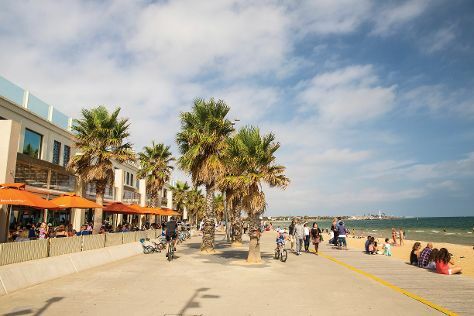 Get outdoors at St. Kilda Beach and Brighton Beach. You'll find plenty of places to visit near St Kilda: Dandenong Market (in Dandenong), McClelland Gallery & Sculpture Park (in Langwarrin) and Ferntree Gully Quarry Reserve (in Ferntree Gully). There's lots more to do: get to know the resident critters at Werribee Open Range Zoo, browse the different shops at Chadstone - The Fashion Capital, take a leisurely stroll along St Kilda Pier, and look for all kinds of wild species at Damper Creek Reserve. To find maps, traveler tips, photos, and tourist information, refer to the St Kilda road trip website . Singapore, Singapore to St Kilda is an approximately 11-hour flight. You can also do a combination of flight and shuttle. The time zone changes from Singapore Time to Australian Eastern Standard Time (Victoria), which is usually a 2 hour difference. Prepare for colder weather when traveling from Singapore in May: high temperatures in St Kilda hover around 20°C and lows are around 10°C. Wrap up your sightseeing by early afternoon on the 2nd (Sun) to allow time for travel back home.